Typhoon Kilo, the everlasting Pacific Ocean storm, has achieved quite a bit in its long lifetime. Previously a hurricane, Kilo was reclassified into a typhoon as it hopped the international dateline on Tuesday. Now, forecast to strengthen over the next several days, Kilo is likely to become the longest-lived tropical cyclone in any ocean basin this year – swirling through the Pacific for at least another week. We first started talking about Hurricane Kilo back on Aug. 19. It wasn’t a hurricane yet, just an area of thunderstorms that many forecast models were suggesting could threaten Hawaii. Batten down the hatches, this could get really ugly. It's not going to die down anytime soon, so I hope all take the warnings seriously and take the necessary precautions to stay safe. Possessions can be replaced, people can not. A picture worth 1,000 words. Thanks to NASA for the image. Tropical Depression Kilo remains on a track south-southwest of Kauai, with the potential to restrengthen into a tropical storm as it moves farther away from the Hawaiian islands, according to the Central Pacific Hurricane Center. While it is moving away from the state, its counterclockwise spin is sending moisture to the Hawaiian islands, with heavy downpours and flooding conditions Monday morning. Forecasters said at 11 a.m. Monday, Kilo was located about 730 miles west-southwest of Honolulu with sustained winds of 35 miles per hour with higher gusts. It was moving toward the north-northwest at 7 miles per hour. 1 a.m. Wednesday, Sept. 2, Wake time: Kilo, which began as a tropical depression and morphed into the central Pacific’s third tropical cyclone of the season, is set to become the second such storm to cross the International Dateline and become a northwest Pacific typhoon, much as Halola did in July. Kilo has moved erratically since it formed nearly two weeks ago south of Hawaii. The Joint Typhoon Warning Center depicts Kilo to begin moving almost due west in the coming day or so, then intensify, reaching a peak of 144-mph sustained winds and 173-mph gusts at the end of the current forecast period. Where it heads in the long term is open to question. There’s a vast spread among dynamic solutions, regarding the timing of Kilo’s forecast turn west. It could venture closer to Wake; it could continue west toward Japan; it’s anybody’s guess at the moment. PST will keep an eye on Kilo. As for Hurricanes Ignacio and Jimena, they each appear to be tracking well north and east of Hawaii, away from land masses. While Typhoon Kilo will narrowly miss Japan, Tropical Storm Etau is already bringing flooding rain to parts of the country. Tropical Storm Etau formed south of Japan over the weekend and has become better organized as it moved northward early this week. 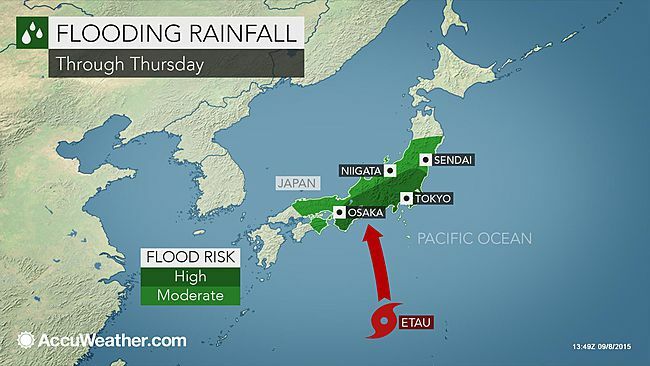 Etau will track generally north to northwest bringing the tropical system into Japan with landfall expected on Wednesday; however, moisture from Etau is already being pulled northward into Japan. A double whammy, trouble times 2. Not the time to go down to the water to check out the waves, history shows it's a dangerous practice as is driving through a flooded underpass. Safety first, it's just not worth it. Banks of the Kinugawa River collapsed shortly after noon Thursday following torrential rain in Joso, Ibaraki Prefecture, flooding a residential neighborhood and creating scenes of devastation. Aerial images showed dozens, if not hundreds, of houses hit by a torrent of water, with some crumbling and being swept away. Sure hope everyone took precautions. Between Typhoon Etau and Kilo the country is taking a double hit from Mother Nature.